Our sushi chef: I should know this, but I forgot to ask :(. He’s the guy in the picture! I’ve wanted to try Hatsuhana for a while because I’ve heard from many friends that it has great sushi that won’t completely empty out your bank account—it was yet another sushi restaurant in NYC for me to try haha. (There are so many…) Anyway, my friend decided to visit me in NYC this weekend, and he also wanted to buy me dinner as thanks for a previous favor. I figured we could go to Hatsuhana because he had been craving sushi, I hadn’t tried this restaurant before, and it wasn’t super expensive! The restaurant’s located in Midtown and isn’t too hard to find. It’s very clean and spacious, and there are even two floors. The second floor has a big sushi bar and also a bunch of tables, while the first floor has a smaller sushi bar and no tables, where people can eat in a more private setting. People usually reserve for a certain chef that they like if they are regulars. 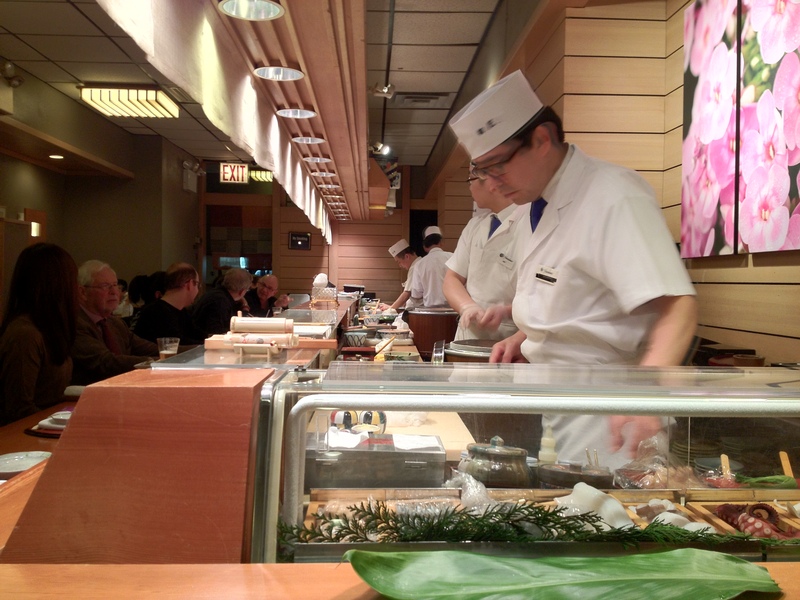 There’s a pretty good selection of nigiri; they have around 50 pieces. Our sushi chef was pretty fast, but it didn’t feel rushed at all. The meal overall was pretty enjoyable and relaxing! Our sushi chef gave us several pieces at one time. I personally prefer getting one piece at a time so that there’s less time between when the sushi chef prepares the piece and when it enters your mouth, but oh well. No big deal. -The fish was pretty solid. Honestly, I think the seafood from a bunch of these sushi places are starting to blend together for me now… I can’t quite tell the difference as well as I used to be able to :(. -The temperature of the rice was about right, but it was a little too grainy at first. Fortunately, the rice improved and became softer in the latter half! 1. Kanpachi (amberjack) from Japan. 2. Shima aji (striped jack) from Japan. 3. Hamachi (yellowtail) from Japan. 4. 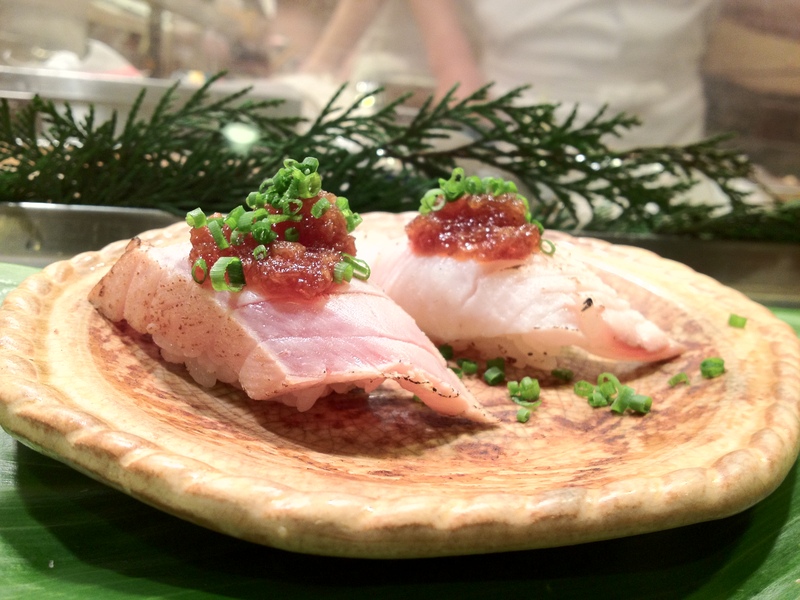 Hamachi toro (yellowtail belly) from Japan. 5. Bluefin akami (lean tuna). 6. 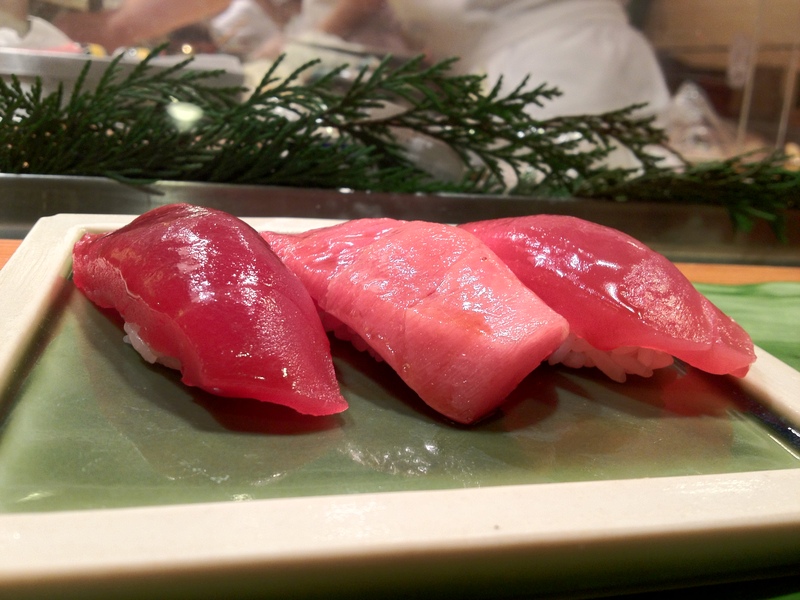 Bluefin toro (fatty tuna). 7. Bigeye akami (lean tuna). 8. 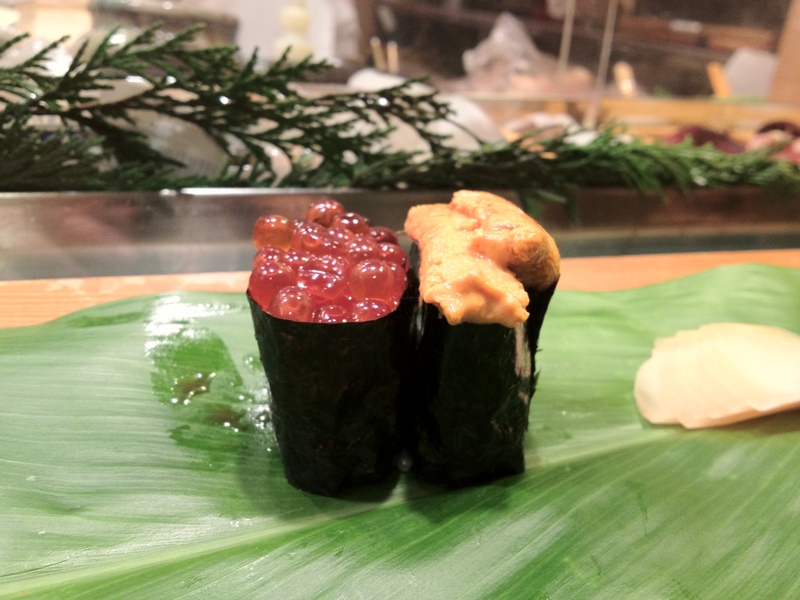 Ikura (salmon roe) from Alaska. 9. 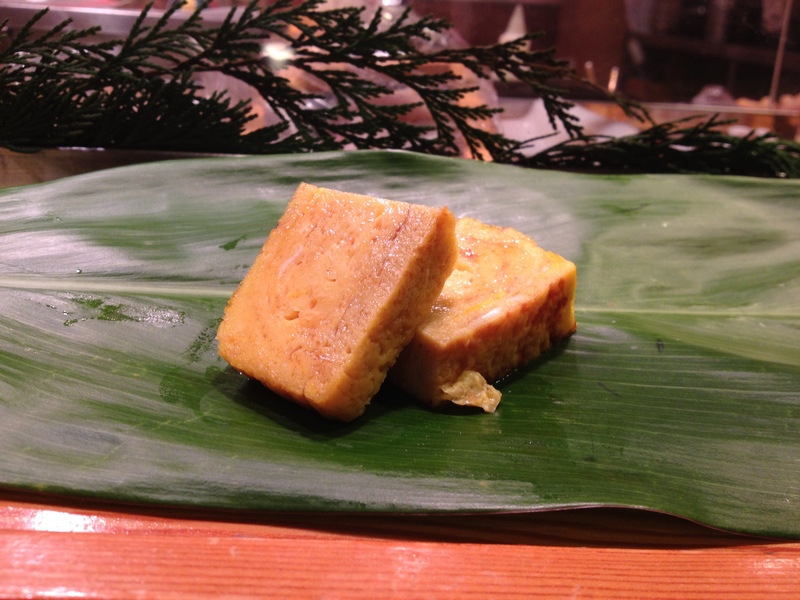 Uni (sea urchin) from Santa Barbara, CA. 10. 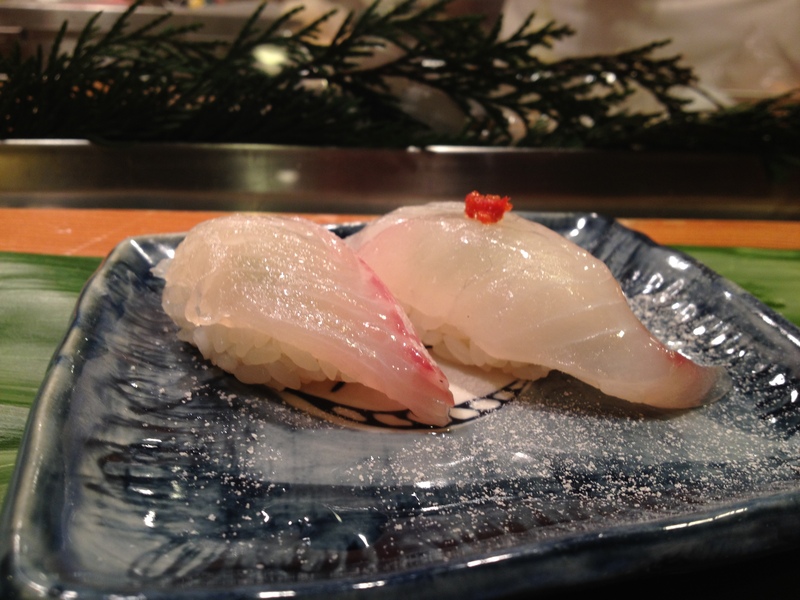 Madai (red snapper) from Japan. 11. 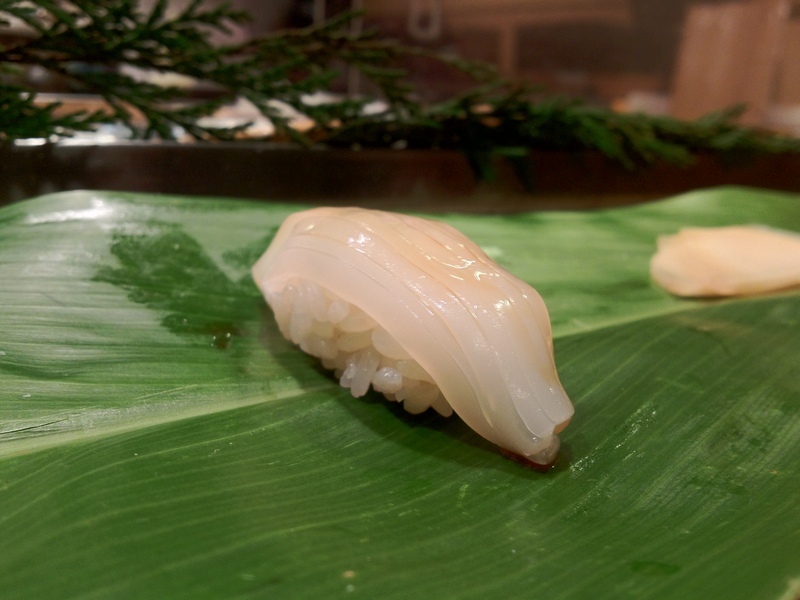 Hirame (fluke) with sea salt. The hirame had way too much salt! 12. Sea trout with chili pepper. 13. 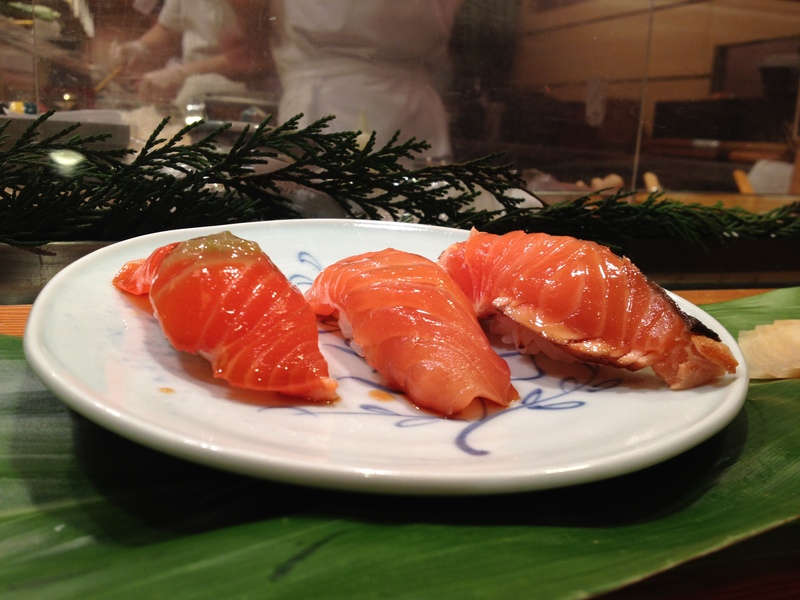 Sake (salmon) from Scotland/Norway. 15. Seared sawara (Spanish mackerel) in garlic sauce. 16. Seared maguro (tuna) in garlic sauce. 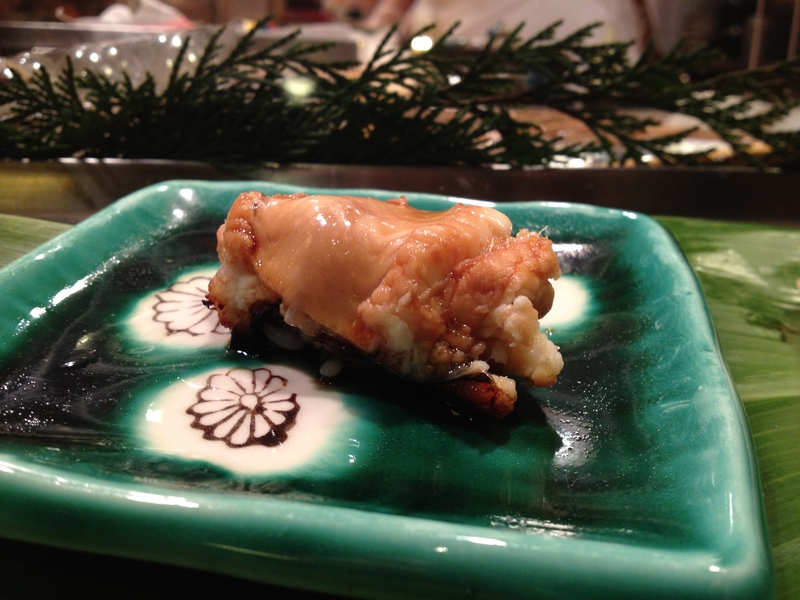 For both pieces, the garlic sauce was too strong—it overpowered the fish. 17. 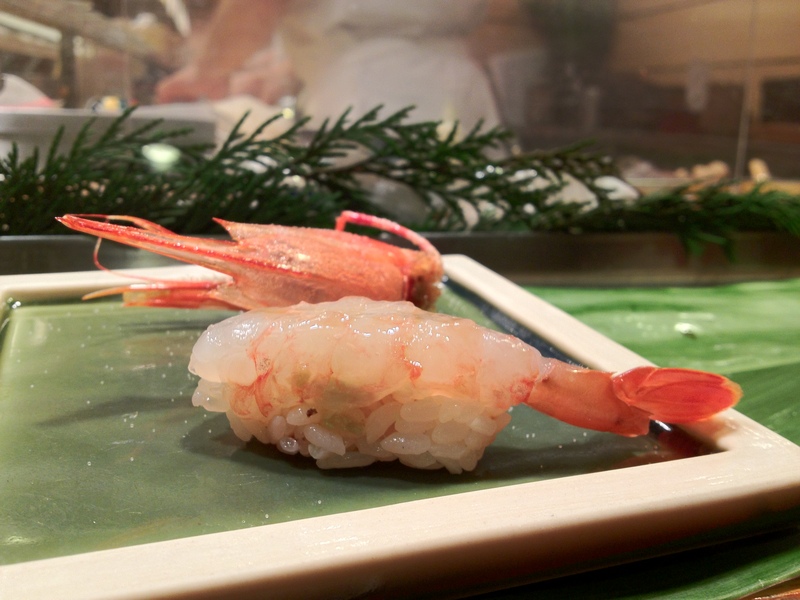 Botan amaebi (Botan sweet shrimp) and fried shrimp head. 18. 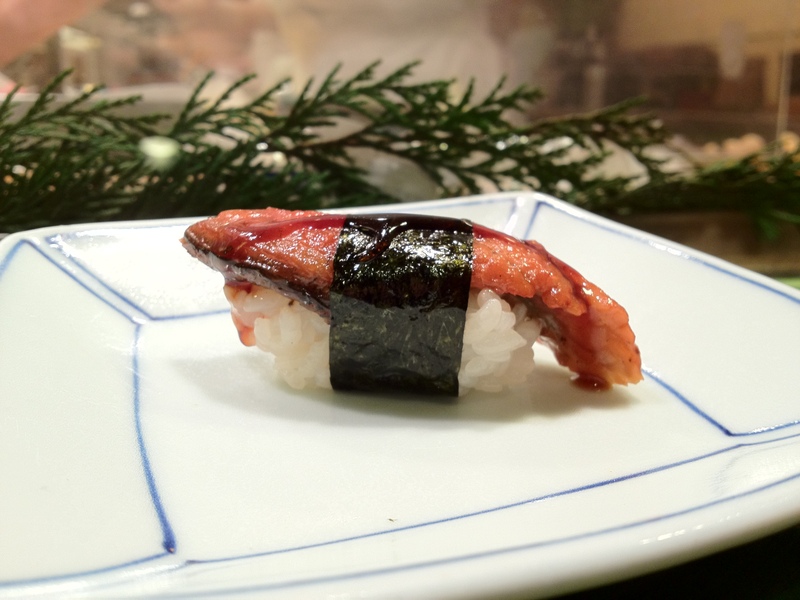 Unagi (freshwater eel) from… Taiwan or Japan (I’m not sure). 22. 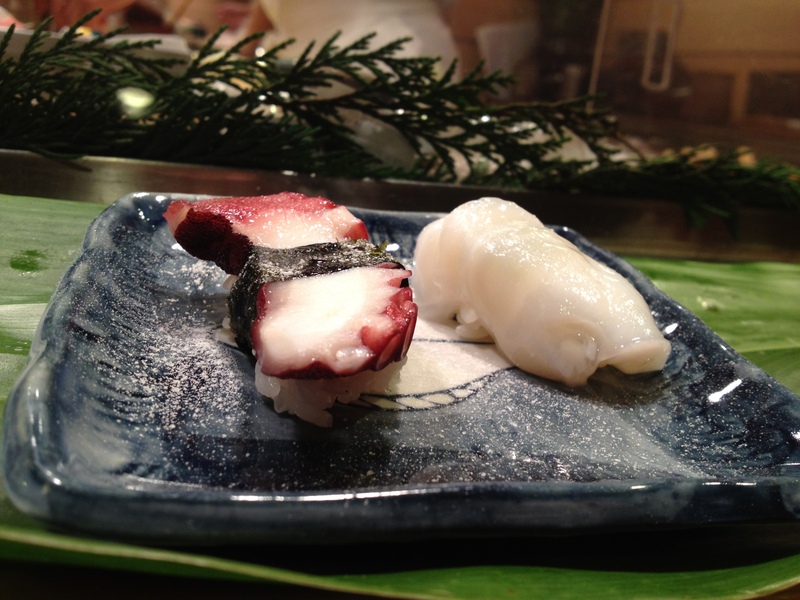 Tako (octopus) leg, from Japan, with lemon and sea salt. 23. Tako (octopus) body, from Japan, with lemon and sea salt. 24. Anago (saltwater eel) from Japan. 25. Yari ika (spear squid) from Long Island. 26. Iwashi (Japanese sardine) from Japan. 27. 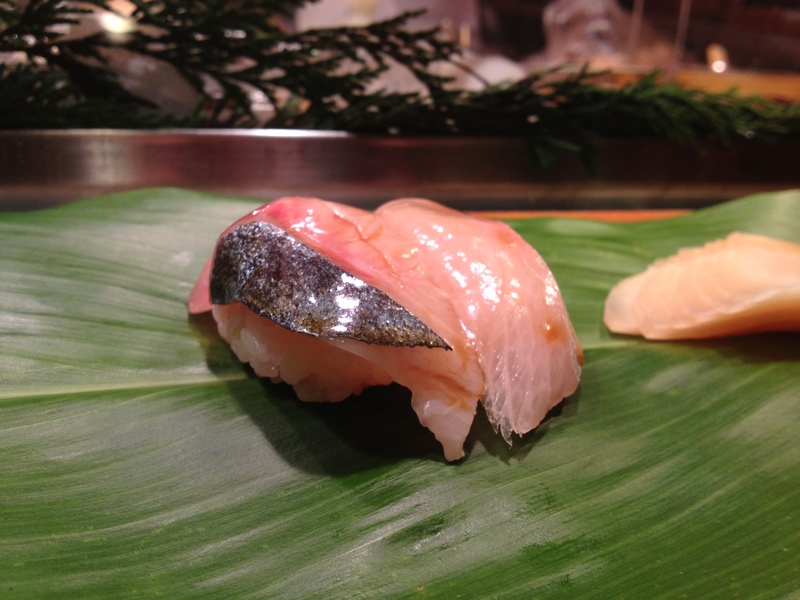 Kohada (gizzard shad / spotted sardine) from Japan. 28. 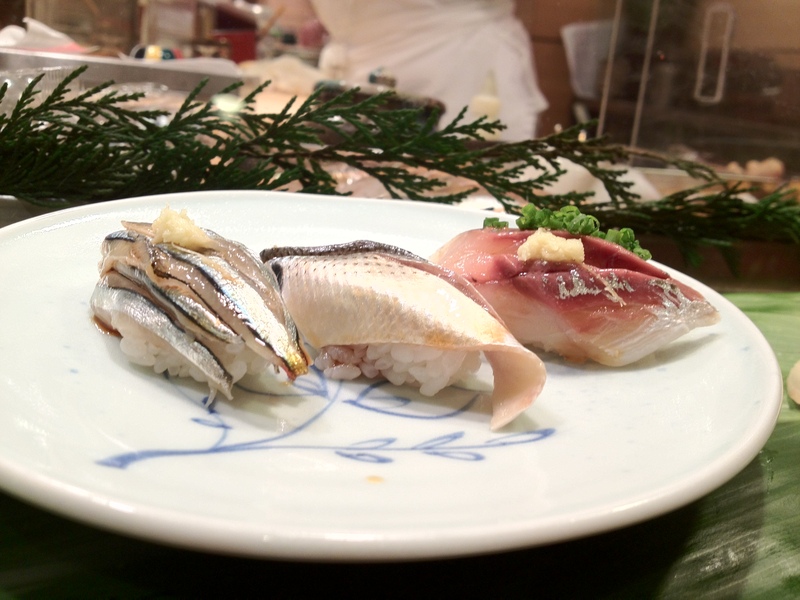 Aji (jack mackerel / horse mackerel) from Japan.